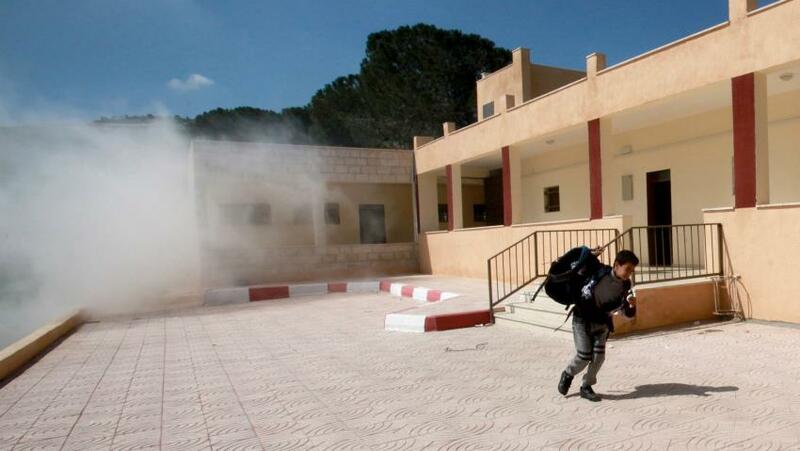 Hebron, ALRAY – Dozens of Palestinian students and teachers were suffocated this morning after Israeli forces fired teargas canisters at their school southern of Hebron, Palestinian sources reported. Israeli soldiers fired a heavy barrage of teargas into al-Nahda elementary school for boys as the students and teachers were entering the school causing suffocation that required immediate treatment, the sources said. Al-Nahda is not the only school suffering from Israeli army attacks. Eleven other schools in the Israeli-occupied part of Hebron, known as H2, face a similar fate in addition to the harassment the students and teachers face as they pass through Israeli army checkpoints when going and returning from their schools and the harassment by fanatic Jewish settlers who have settled that area under heavy Israeli army protection.